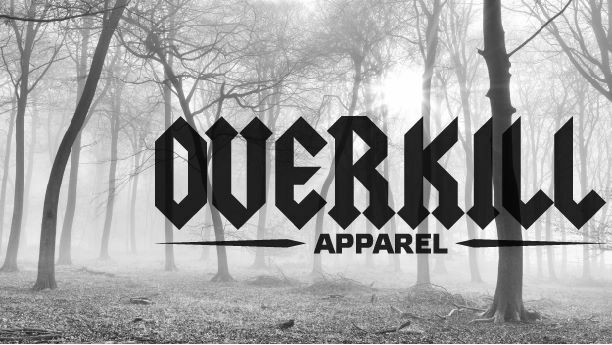 Overkill Apparel are a pretty cool clothing company I had the pleasure of coming across while I was at MCM this year, I was helping out on the big Machinima SBOC stand and Overkill were doing teaming up with them and doing a giveaway. From the second I spotted one of their jackets on our stand I fell in love, and I did not shut up about it all weekend, that was until I finally got one of my own, (I still can't quite believe they gave me one just for helping them out! ), I had actually headed over to their stand to purchase one! They were really lovely people and as someone who is constantly looking for new brands to purchase from it was really nice to find a new one to add to my list. I love this jacket more than words can describe! 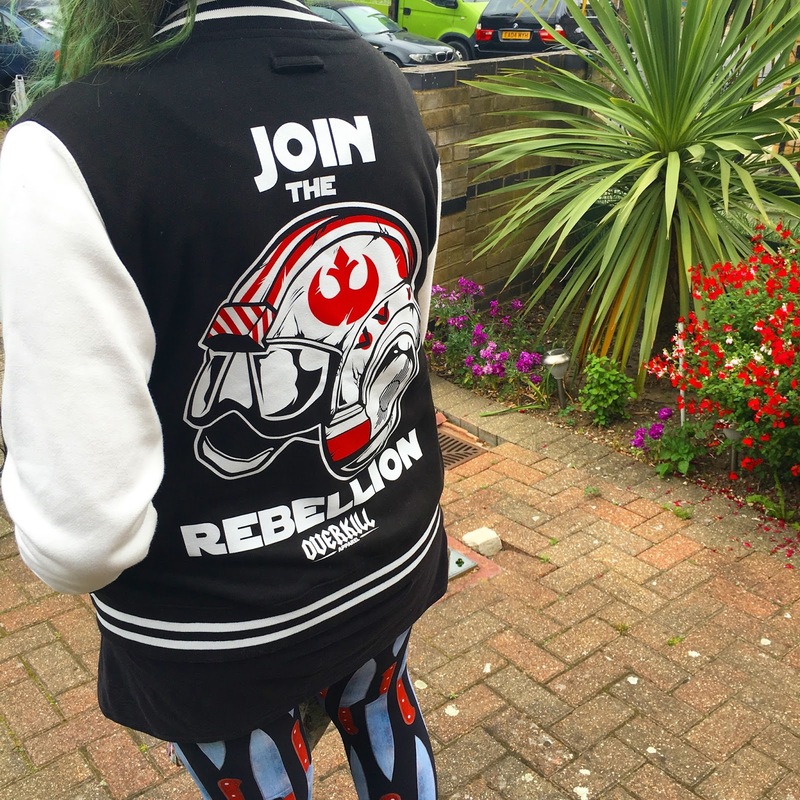 Seriously though, how amazing is that jacket?! 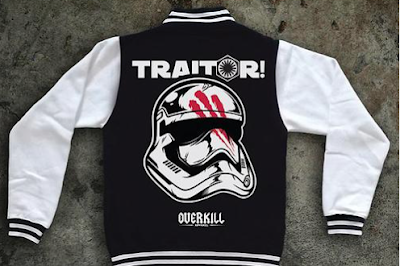 I'm a big star wars fan, so the fact they have three jackets with different Star Wars designs on made it extremely hard to decide which one I wanted. So much so I'll likely pick up another one once I'm less skint! The best bit though, they are only £35, which in my eyes is a total bargain, the jacket itself is super soft and has that cool vintage look about it. Working for a clothing company myself, I've become incredibly picky with materials for the clothing I wear and also the print quality is always a big factor for me as I do that as my day job, I'm happy to report the fabric is super soft, and the print is really great and I've already washed the jacket and it's come out as good as it went in. Beyond their Star Wars related stuff they have some other cool designs, more on the tattoo design style prints, I'm particularly looking forward to seeing more of those prints as the designs they had at MCM were pretty awesome. It's always nice to discover a new brand in it's early stages and being able to watch it (hopefully) hit the big time, as they certainly deserve it with how lovely the team all were! I don't usually post many clothing related posts despite the fact I work for a clothing company, and as a blogger have been gifted/offered clothing for free to write about etc, I prefer to only write about companies I love purchasing clothes from. (Oh I do love the company I work for, but I just don't really want to write too many posts about where I work!) Overkill however were a different story, I genuinely love the brand and they only gifted me the jacket due to helping them out at MCM, which again is super lovely of them! They won't expect me to write a post about them (Hi guys! 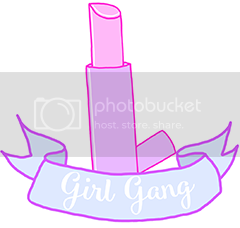 Yep I have a blog too! ), but they are awesome so how could I not write something about them!